Poodle Crochet references a recognisable object whilst at the same time emphasising the materiality of the painterly surface. 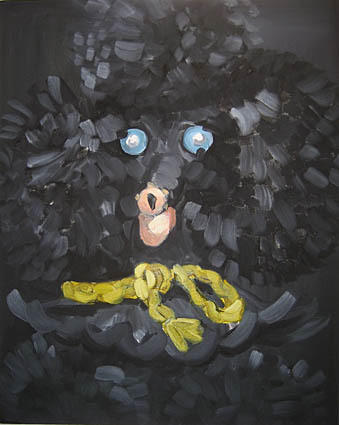 Sharma is drawn to the discarded, mass-produced, domestic ornaments from her own childhood and background such as this poodle which cleverly conceals a wine bottle under its pom-pom head. Other objects in her repertoire include Spanish dancers, seaside souvenirs, Murano glass figurines, shell animals and Pelham puppets. This restricted idiom provides infinite creative potential to transform the objects into painterly icons.